The winner Lucien Weiss with his D-stain. Lucien Weiss, graduate student in WE Moerner lab from Stanford university is the winner of the first digital stain competition. We interviewed him to learn more about his “super-resolved” world and his experience with STEVE. You can find the interview below. Thank you Lucien for participating, we hope you enjoyed the competition and we wish you all the luck for the end of your PhD and for your future. Lisa Pollaro, (LP): Thank you for joining us Mr. Weiss; would you first introduce yourself and tell us a little about your background? Lucien E. Weiss (LEW): Good morning Dr. Pollaro. First, let me say thank you for the opportunity to be speaking with you this morning; I’m honored to have been chosen as the winner of the D-stain competition. I’m a sixth year graduate student working in W. E. Moerner’s Lab at Stanford University, where I have been characterizing the Sonic Hedgehog signaling pathway in mammalian cells using highly-sensitive, single-molecule imaging techniques. LP: Fascinating! 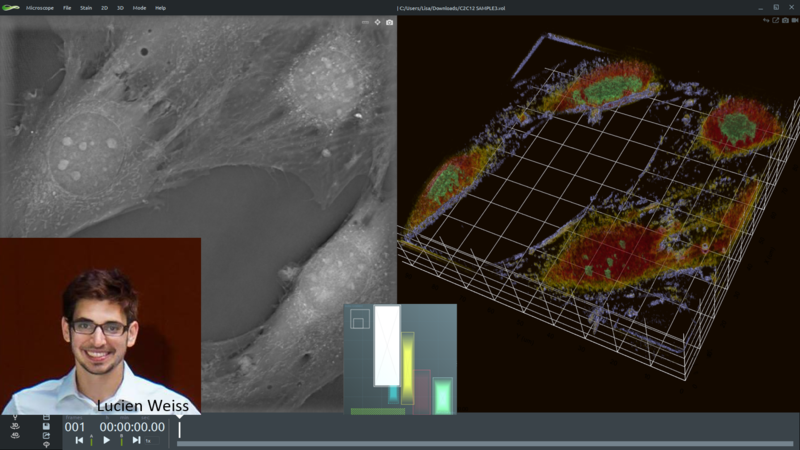 Tell us about how you first met Nanolive, I believe you came by our booth at the American Society of Cell Biology in Philadelphia back in 2014, and that you’ve gotten to see the 3D Cell Explorer prototype in Stanford in 2015 and now you had a chance to use the software, tell us about your impression. LEW: Very exciting stuff; it has been very neat to learn about the launch of a commercial product that makes a new technology available to the broader community; whenever that happens, it starts to enable some awesome new science! Specifically, about the 3D Cell Explorer, I think one of the most exciting things is how the refractive index and gradients can be used to map out a cell so well. LP: What made you sign up for the D-stain competition? How long did it take you to complete the whole process? LEW: Always interested in testing out new technology, I suppose. I would say the whole thing took me maybe an hour and a half, but I can be fairly picky and was trying it with no previous knowledge of how it worked, except watching a short video tutorial. I would say it would only take 10-15 minutes if I were to do it again now that I am more familiar with the software. LP: Great, thanks for your feedback. How would you compare the technologies you use every day with this new holographic tomographic approach? Do you see any complementarity? LEW: Great question; it could definitely be a complementary approach for us. For instance, we could characterize cells according to their physical properties and maybe evaluate morphological peculiarities in the cell lines I am analyzing that are too obscured in 2D, bright-field images. Really there is just so much to do in terms of using [holographic tomography] for label-free contextual information and of course just continuing to figure out what we can learn. I could go on for a while, but one of the things I’m really excited to see, is further development of the Nanolive system maybe the incorporation of fluorescence data?! LP: Well thank you again Mr. Weiss and congratulations!